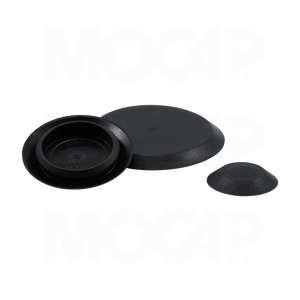 MOCAP SMFM Series Polyethylene Sheet Metal Finishing Hole Plugs feature a flush head and are designed for metric hole sizes. Snap-in sheet metal hole plugs provide an attractive finish and a secure fit. MOCAP Polyethylene Plastic Flush Head Sheet Metal Hole Plugs are used to plug holes on appliances, automobiles, tanks or anywhere a finished look is needed. SMFM Series sheet metal plugs are available in sizes to fit 8mm to 22mm diameter holes. MOCAP stocks Sheet Metal Hole Plugs Flush Metric in many sizes for immediate shipment.